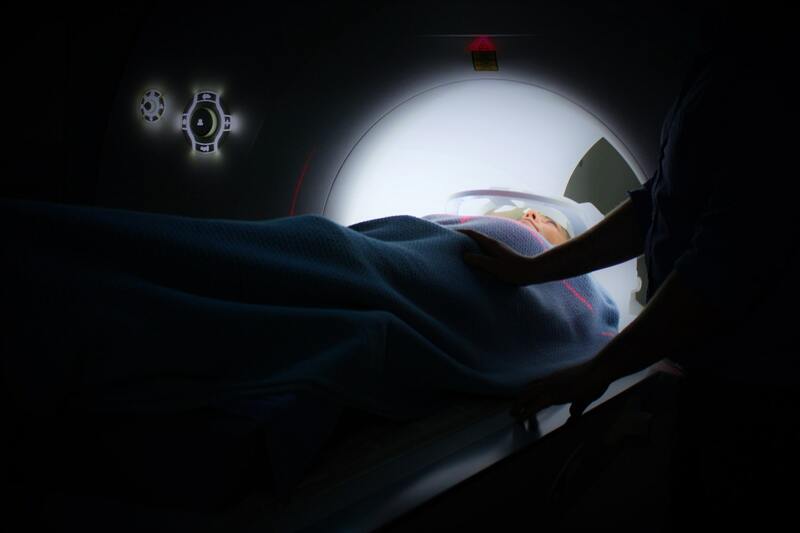 Dementia, which includes Alzheimer's disease, is now the biggest killer in the U.K. and has higher health and social care costs than cancer and heart disease combined. Dementia also places a significant burden of care on family members and all those around them. Alzheimer’s Society is the UK's leading support and research charity, with over 2,600 employees and 10,000 volunteers, working to help those living with dementia and funding medical research. One of the main goals of Alzheimer’s Society is to design healthcare services that help those affected by dementia. In order to build better online tools for their care, you need excellent research on those with dementia, their primary carers, and wider family. It also turns out that getting access to those people, in-the-moment, to understand their needs is incredibly difficult. People living with, and affected by, dementia have wildly unpredictable schedules, are geographically dispersed, and are not typically found in traditional research participant databases. 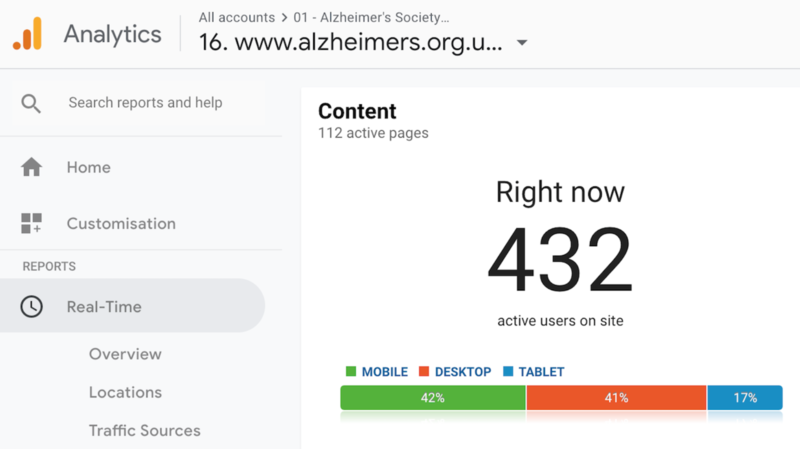 I knew we had hundreds of people affected by dementia using our online services at any given moment, but we didn’t have a way to reach them directly. Even when we managed to find someone using our internal teams and systems, contacting and screening the person meant navigating through inefficient workflow processes. For example. it would take days-to-weeks before the participant was contactable for an initial screening. In a large healthcare organization, there are numerous reasons for these kinds of barriers. These range from cross-silo working to privacy, legal and ethical compliance — something that is especially important for safeguarding people living with terminal-progressive diseases. Nevertheless, we work with the speed and scale of an agile design environment, and I have extremely limited time to integrate UX research into our project processes. I’m now able to easily invite, screen and manage users through live site intercepts. Instead of working across systems and through many intermediaries we are able to contact and screen all participants and collect an almost infinite, self-sustaining pot of potential participants for research. Ethnio reduces the time and effort it takes to contact a single participant from hours and sometimes even weeks to mere minutes. The impact is like having a dedicated research operations role (#researchOps) supporting my research, but on-demand and at only a fraction of the cost. 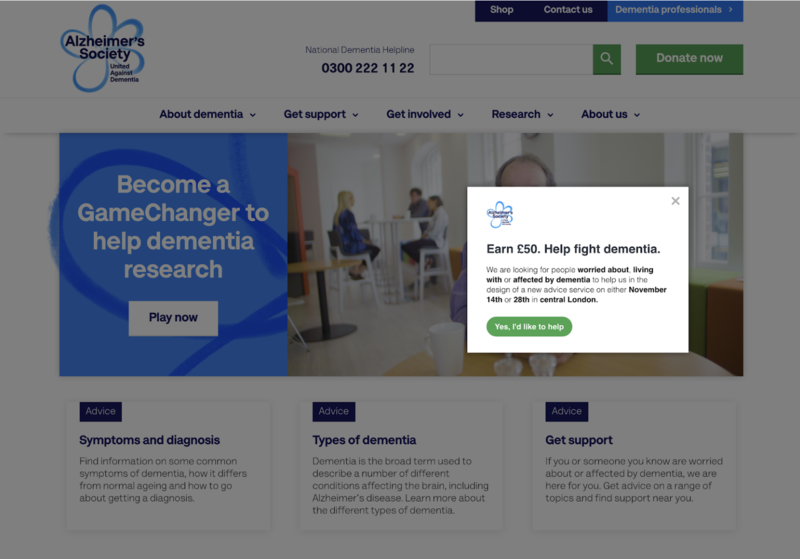 For Alzheimer’s Society, this type of research removed many pain-points and exponentially decreased the opportunity cost of deciding to run UX research. Ethnio has provided our Digital team with a greater willingness to validate hypotheses and to experiment with innovative ways to include people with dementia in the design of their support services. UX research can provide incredible insight into the lives and needs of those most deeply affected by dementia. Ethnio lets me focus on the challenge of designing for this audience that so desperately needs better resources to help them cope with one of the world’s biggest killers. This lets my team and I build those resources instead of wasting time on the logistics of finding the right participants. The use of Ethnio goes far beyond UX research, as we now look to redesign our organization’s User Involvement Database. Lessons from how Ethnio has enabled us to bridge the gap with our services users will be applied directly to its redesign to increase the Society's exposure-hours with people affected by dementia across all of our initiatives. These lessons would not be possible without Ethnio helping us reach people affected by dementia, in-the-moment. Rik Williams is UX Architect at Alzheimer's Society. Learn more about how to design digital services for people with dementia. Alternatively read about how dementia is now Britain’s biggest killer. If you’ve worked in the healthcare or enterprise software spaces, you know getting vendors approved can take a significant amount of time and documentation. Here are the key steps we took to get Ethnio approved for an intercept, scheduling, and incentive payments. *Not a doctor: worth noting that Ethnio doesn’t help with medical research. We’re talking about researching and building digital tools to help those who are affected by the disease.